Melt margarine in a large saucepan over low heat and add marshmallows. Stir until they begin to melt, adding in cake mix one spoonful at a time so its combined. Stir in cereal so it is completely coated with marshmallow mixture. Sprinkle in half of the sprinkles and mix. 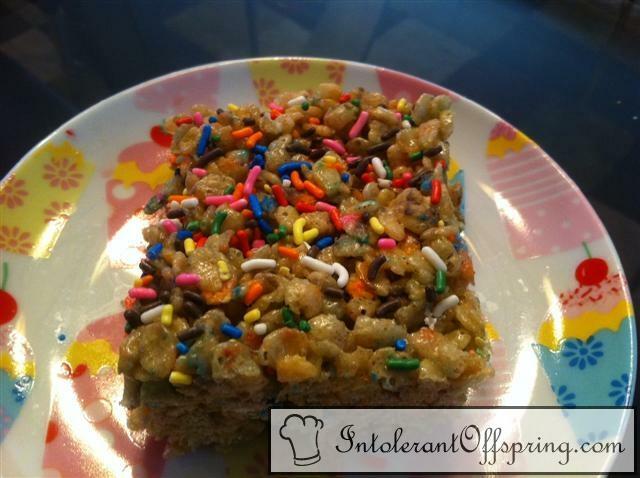 Press into a baking dish (9x13 for thinner, 9x9 for thicker) and top with remaining sprinkles. Let sit for about 30 minutes before cutting.